Hi. My name is Hope and I'm going to be writing here every other Wednesday. For my first day blogging here I'm going to talk about the story of my baby sister. Well, we were sitting having dinner one night and my mommy said she was preagnet. And to tell you the truth I was not very happy. Actually I cried A LOT. But then a lot of months passed by and I started to like the idea of having a baby sister. We also took a shopping trip for baby stuff. Then a few more months passed by and it was time for her to be born. When I first saw her she was still coverd with belly juice so I would not touch her, but the nurse gave me some gloves so I could touch her. When I put my finger inside her hand she grabbed it really hard. She had blue eyes. Her name is Poesy. Another thing I can tell you is that she is the ultimate milky face. She's almost five months old now and she thinks I'm really funny! Well that's all I have to say. Talk to you next time! Bye! Hope, you are too cute. I am so excited to read your future blog posts! You're Mom rocks too! PS- your blue hair is so cute. This is so adorable I just may have swooned. This is the cutest thing ever! Hope, you are an amazing big sister! Katie, you are a great momma! I love this! I think it`s awesome that you`re now blogging, good job. My babysister (she`s your age, too) and I very much enjoy reading your moms blog. Hope, I think your blue hair is pretty cool. Nice work on your post. ps - I love your blue hair! First off, LOVE the blue hair! Second, I can't wait for more posts from you, Hope! 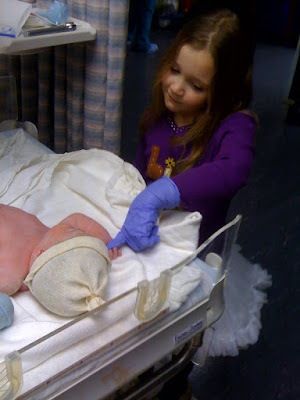 Third, you are such a good big sister! Poesy's lucky to have you, I'm sure you'll teach her so much! You are so adorable Hope! Can't wait to see what else you'll be writing about! Hope! You're as cute as a button, a brilliant artist and already a well loved blogger! I do believe serious congratulations are in order! I'm so happy you're loving having a baby sister. And I'm glad she thinks you're really funny. I think it's probably pretty important to have a funny and nice big sister. Hi Hope! My mom had a baby when I was 10 and I was sad at first too but I'm 30 now and my brother is 20 and I love him so much! Poesy is lucky to have a cool older sister like you. You are an AMAZING writer and I can't wait to see what your next post is about! I'm so happy that you love your baby sister. It took me a while to love my baby sister, too, but now she is one of my very best friends! Have a super fantastic day, pretty girl. 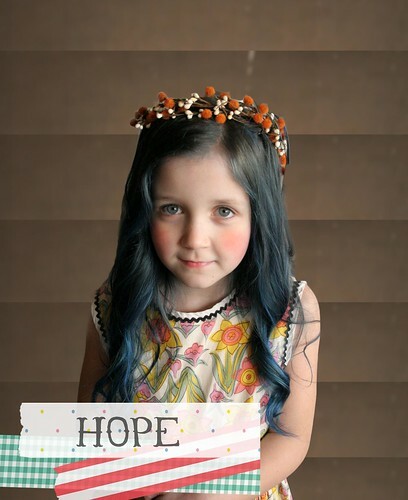 Hope, you're so cute and I love your pretty blue hair! I can't wait to read more posts from you. Hope you are so adorable! Your mama should be super proud of you! What a sweet post!! I'm in love w/ her blue hair! Simply in love! oh, that Hope! she slays me with her cuteness. i'm excited to read more from her! I am now going to look forward to every Wednesdays! Thank you for sharing your story with us, it was really cute! You write so well :)! omg. this is the cutest thing ever. way to go hope, can't wait to read what's next! Hope, you are a very good writer. hope, you are a doll. your hair looks absolutely amazing blue as well. it sounds like you and your sister have an amazing relationship already...it's only going to get more fun as she gets older too!! Such a great first post, Hope! And what a lovely profile picture! hi hope! so glad you are joining us on your mom's blog! i love your story about meeting your baby sister. you are such a good big sister to love her so much. cant wait to see what you have to talk about in two weeks! i die! hope, you are seriously adorable. Miss Hope, I really enjoyed your story about your baby sister! So glad that you ended up being happy about your mommy having another baby.:). Just means your mommy has a lot of love to give! Great job on your first post and I can't wait to read more from you! How simply adorable you truly are Hope. So nice to read your first ever post on blog. Keep up with the wrinting and inspiring the world through your eyes. that was way too cheezy. My bad. I'm glad you love being an older sister, Hope! I just had a baby a month ago and she has a big brother who is 6 and a big sister who is 4. They love their baby sister just like you love yours! I can't wait to read your next post! I love your hair, Hope! I recently dyed the tips of mine pink and blue (it sorta looks like cotton candy.) It's so much fun! Can't wait to read your next blog post! LOVE IT! The last picture of you with your little sister is adorable! his daughter has blue hair .... very beautiful! as he did? that is the cutest thing I've ever seen! Such a sweet sister! hope! you're wonderful! excellent blog post, miss! What a cute idea! I bet she will have a ton of fun creating her own posts. Fabulous first blog Miss Hope! I can't wait to read each and every post you have coming our way! I have an older sister myself and she's one of my all time favorite people. Poesy is so lucky to have you! You are a marvelous writer! I am very jealous of your cute blue locks :) Thanks for sharing your story - Poe is certainly a lucky girl to have such a great big sister! That last picture has precious written all over it. You have two incredibly photogenic daughters! jeremy & i almost spit out our coffee reading this. i was reading it out loud..... belly juice? a m a z i n g! i hope we have a kid just like her... someday. Hope!! Thanks or sharing! I love your Blue hair and I can't wait for your future posts!! Your baby sister is beautiful! Hope, It is so sweet that you wrote out the story of your precious baby sister! You know both you and she will love to read this and look at the pictures, when you're older! I remember when I was 4 years old and my baby brother was born, I was not very excited. I asked my mom (while he was crying and screaming) if we could "take him back" because I wasn't sure I wanted him anymore if he was always going to be so loud. HAHA! You are so beautiful and smart and sweet and I loved your blog post! I can't wait to read your next one! Great job Hope! You are a good writer & I can't wait to read your posts. My daughter is 10 and we are going to be homeschooling next year for the first time. I would love to hear from you about homeschooling. What you do like? What don't you like? Hope--You rock. I love your hair. It's so awesome. Have a great day! Hope, you are a great big sister with awesome blue hair! Poesy is lucky to have such a cool girl to look up to. Good Job Hope! Your little sister is very lucky to have such a loving big sister! what lovely words from the big sister. I can't wait to read more from her. This is the best idea EVER! Can't wait for Hope's next guest spot. Oh my this is too cute! Hope you are one awesome girl! Can't wait to read the rest of your blog posts! Hope, you are the cutest blogger ever. I can't wait to read more! Poe is so lucky to have such a sweet big sister!! This post made me giggle and tear up thinking about how much I want a loving, sweet, creative daughter of my own some day. You are a great writer- keep it up! The only thing that bums me out is that you will only be contributing every other week :) Enjoy your summer cutie pie! hi hope, i am jada.i am homeschooled too.i am seven. i have just read about your baby sister.you are lucky because you have a sister,i don't have one. i have three younger brothers.their names are ty,monte and danny.please write back to me.from jada. by the way...love your hair color so much!!! Such a darling post! Poesy is so lucky to have a big sister like you. Can't wait for more of your posts! Bang goes my heart! I wonder if my sister felt the same way when I was born? Great writing, Hope - it's a wonderful habit to get into and you're already pretty good at it, in my opinion! hope, you are such a cutie. (and poesy too!) you rock at blogging and i can't wait to read more of your blog post's on your mommies blog! xo! Ah Hope, you're awesome girl. Keep up the writing, it's wonderful. I am just wondering if Hope has an opening in the best friend department? If so, I would like to apply. Also, ultimate milky face?? Ha!!! Whatever that is, its making me laugh all day, ha ha. Hope you ate just darling! I adore your lovely blue hair + your beautiful words of affection to your baby sister. Have a wonderful day little miss. I read this post with my kiddos and they were so excited. Riley (my 9 year old) has a defunct blog and was inspired to start writing again. Lola (our little sister) said "Little sisters are really great when you get to know them." Hope, you are a very good writer! Keep it up, friend, and maybe someday you will have your own blog like Mommy! I'm glad you love your baby sister so much! Aww, This sweetness brought tears to my eyes. I can't wait to read Hope's next post! hi hope! it's milla plum's mommy. i LOVE that you are blogging along side your mom. we can't wait to read each week. big hugs to you cutie!!! Hi sweet Hopey! I'm looking forward to reading your blog posts! I think that you are going to have a terrifically interesting feature and I'll bet you have a great blog of your own one day, too. I remember feeling a bit conflicted about new siblings when I was a kiddo but my sister Theo (remember her?) is seven years younger than me and we are very best friends now! I think it's so great that you love Poesy so much and you are such a great helper to your mom and dad. You are such a special girl! Watching you grow up is a real treat, lovely girl. Oh and your writing is really good, tell your mama she is an awesome teacher! p.s. I loooooooooooooveeee you sooooooooo much! Hi Hope! I don't have a baby sister, but I have a twin sister and I love her lots too! 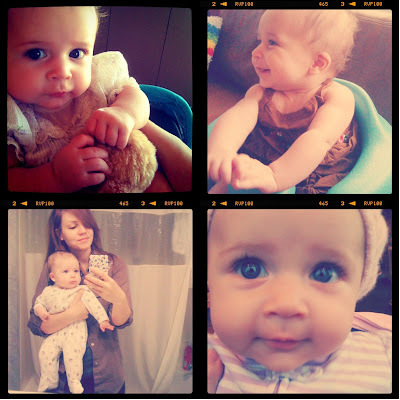 Thank you for sharing on your momma's blog! I cannot wait to read more from you! P.S. Be nice to your mommy and daddy and make sure to listen to them! And we look forward to seeing your posts! Hope, I miss you and am soooo happy that you are such a good big sister! Oh, and you are still the cutest!! I love your blue hair. Hope you have a fun summer! Way to go, ma'am. Awesome post. You are one cool little lady. What a lovely post Hope, so well written - you're a natural! I bet you are a fantastic big sister too, little Poesy is lucky to have an older sister who loves her SO much! You are adorable and I can't wait to see your next post. Congrats on being a big sister!!!! Awwww I'm so looking forward to Wednesday!!! My daughters are only 2 years apart but it still was an adjustment for my oldest, but 99% of the time they are best of friends :) Poesy is lucky to have you! Hope, what a great first blog post! You know, my little sister is 10 years younger than me and I had mixed feelings when she was in the 'belly juice', too. But, when she was born and I was holding her in the hospital I was the first person she smiled at (which I was told by the adults that meant she tooted on me) but that connection made me feel so special to her. I'm sure there will be moments when she's making you a bit crazy like my little sis did me, but being a big sis has been one of the best rewards in my life. I look forward to reading about your big sis experiences! your blog post just made me so so happy. i'm about to have baby number two and i'm really hoping my daughter is as sweet a big sister as you. p.s. your hair is absolutely fantastic! Hope, you're adorable, and that blue hair looks so great on you! 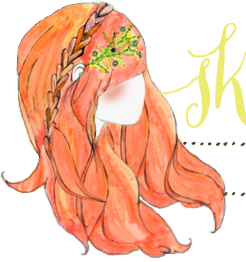 I'm 15 years old, and I wish I had discovered blogging earlier because bloggers like your mama are super inspirational and so cool! I think it's awesome that you're going to be blogging too. When you get a little older it'll be so fun to look back on your old posts and see what you were up to at this age. You're a great writer, keep it up! I look forward to reading more of your posts, hope! Hope, you are adorable and just as beautiful as your momma! I'm excited to read your future blog posts. haha! Oh my word!! Cutest post I have everrrr EVER read! I adore this. Sisters are so special.